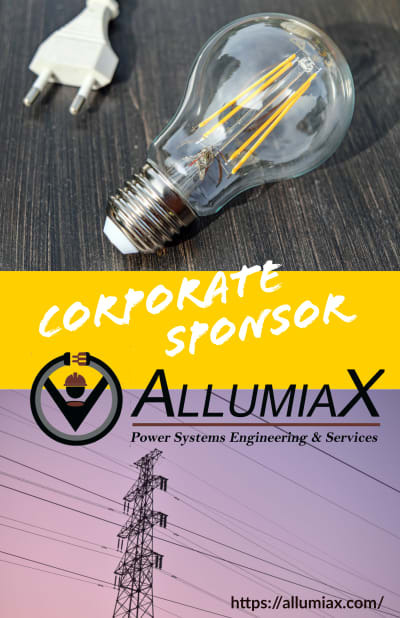 Introduction to the Delta Wye transformer connection – part 6e. In many areas of the power system, especially when we see transformers, we often see this type of illustration for the delta transformer connection. With it, we also see a dashed line that's pointing towards one side of the corner. And that side is always labeled H1. The other corner labeled as H2 and the third corner relabel as H3. 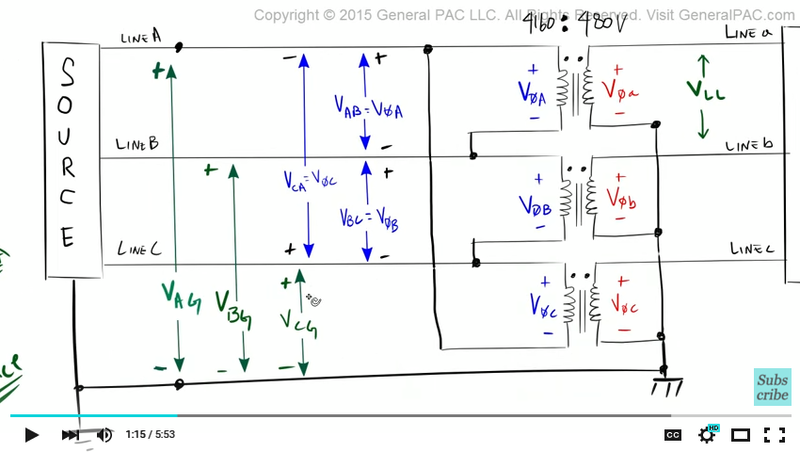 Our goal for this video tutorial is too really understand how to read this phasor diagram and make sense out of it. First, let's note couple things. Let's relabel H1 as A. And H3 as C.
So the next question is – what's this dashed line is? This dashed line represents the line-to-ground voltage. So the next question is – what line-to-ground voltage does it represents? 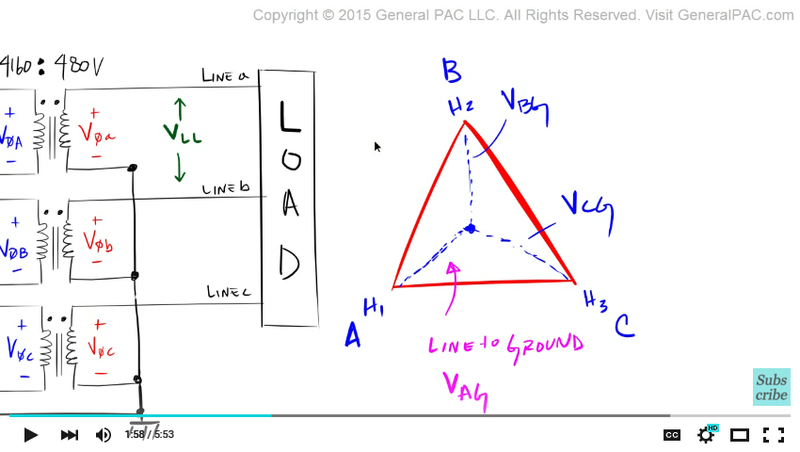 VAG represents the voltage across line and ground. 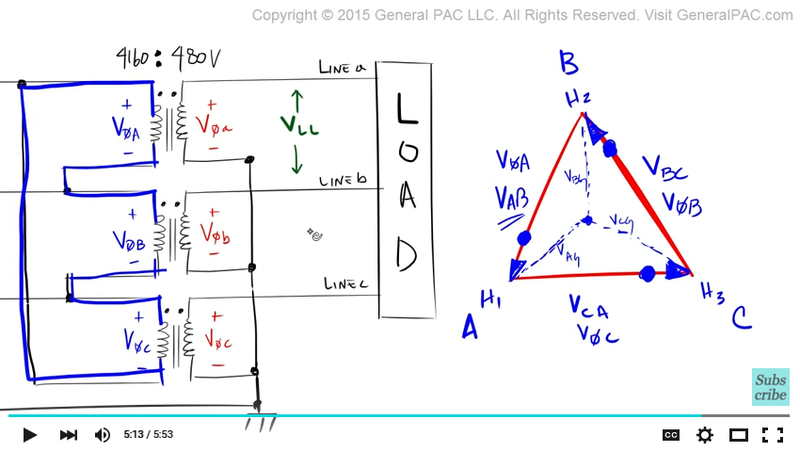 VBG represents the voltage across line B and ground. 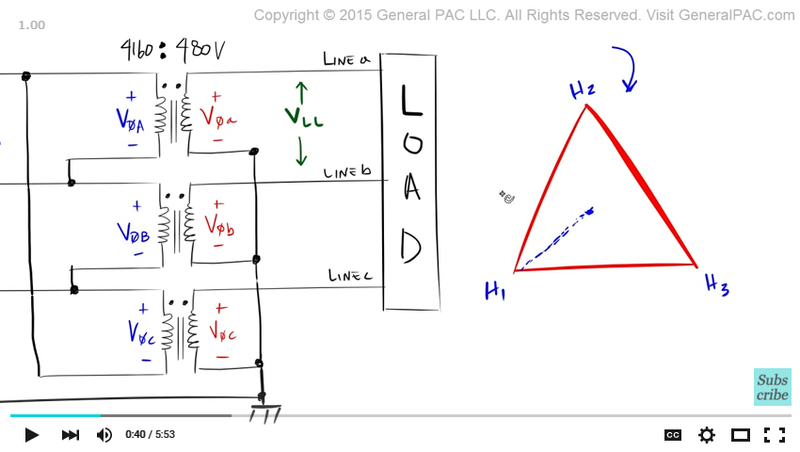 VCG represents the voltage across line C and ground. Since this dashed line is pointed towards H1 or this corner of this triangle, this dashed line represents VAG. Which means, if we put another dashed line here – this dashed line would represent VBG. This dashed line would represents VCG. This is very similar to the example we did in the last tutorial. Let me clear this up and make this smaller. The next question is what does this phasor represent? Does it represent VAB – if so is it connected like this? Or does this phasor represent VCA and if so, is it connected like that. Depending on what we choose or how we define these two phasors – it's going to represent an entirely different delta connection. So we have to be very careful how we defined these two legs of the triangle. Now we look back at our delta connection and we see that it's connected like this. 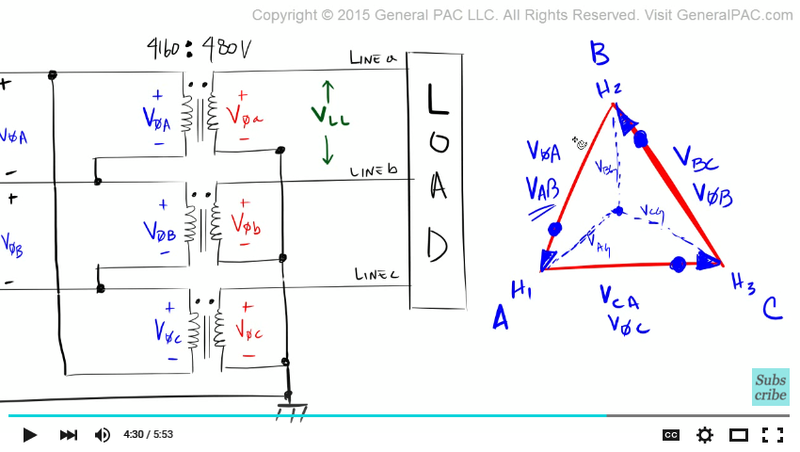 In the last video, we showed that the line-to-line voltage between line A and line B is equal to phase A voltage. Which is equal to the voltage across winding A. So we immediately know that this phasor here represents VAB which is also equal to phase A voltage. So now we're going to put an arrow here. That's how we've defined it. Since the arrow is on this side we're going to put a dot here to indicate the polarity side of the winding. Now that we've assumed this side is V phase A, it becomes very clear that this side here is VCA. And that is equal to V phase C. And this side here is VBC which is equal to V phase B. Now there are couple of things that we can do to verify our assumption. The first thing is – we know that this is VAB because the phasor starts from B and it goes to A. It's opposite then how we've defined. We've defined it as VAB. But the arrow is pointing in the opposite direction. Same thing over here – the arrow is pointing is from A to C but we've defined it as VCA. Then over here – the arrow is pointing from C to B but we've defined it as VBC. The other thing we can do is see how the polarity sides are connected. So V phase A which is this phasor here. The polarity of V phase A is connected to the non-polarity side of V phase C. And the polarity side of V phase C is connected to the non-polarity side of V phase B. This agrees with our transformer connection. The polarity of V phase A is connected to the non-polarity side of V phase C. And the polarity side of V phase C is connected to the non-polarity side of V phase B. So that makes sense. So those are two major things we can do to verify that the way that we've defined and labeled everything actually makes sense. And that's how you analyze this type of a phasor diagram. Now if you find these videos useful, please click on the button that's on the bottom corner of your screen. 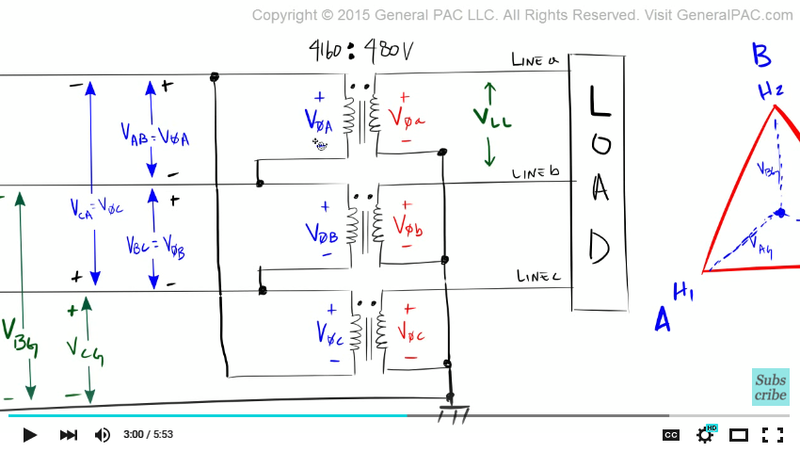 By subscribing, you will be connected to video tutorials like this that make power systems intuitive and easy to understand. This video was brought to you by GeneralPAC.com. Visit this website for additional video tutorials.